In late 2016, Disney Tower closed. It re-opened in 2017 with a theme based on the Guardians of the Galaxy. 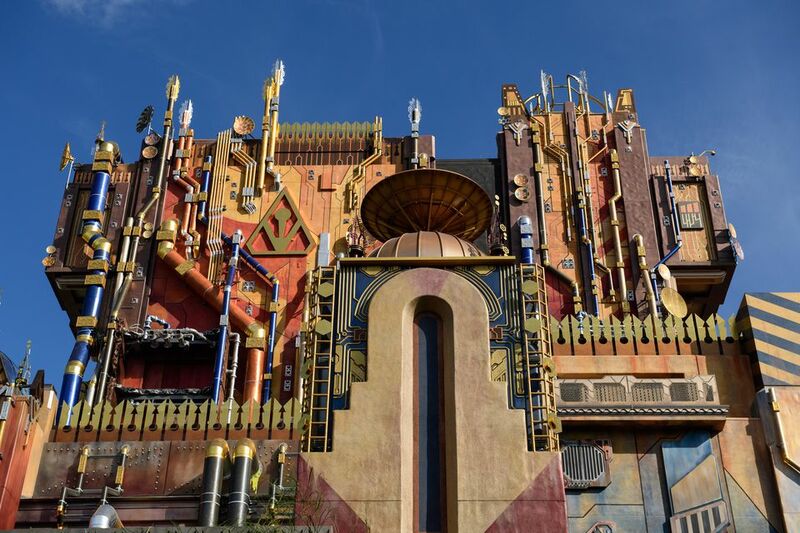 The new name is Mission: BREAKOUT! It uses the same structure as the Tower of Terror, but with a new story. The good news for fans of the Tower of Terror is that the breathtaking free fall sensation will continue, but with new visual and audio effects. Here’s the storyline from Disney: "Deep inside his fortress-like collection, the mysterious Taneleer Tivan (aka The Collector) is displaying his newest acquisitions, the Guardians of the Galaxy. They are trapped in customized display cases, suspended over a vast abyss. Unbeknownst to their unscrupulous captor, the intrepid Rocket has escaped and is enlisting the Collector’s VIP guests for help. The title implies the storyline. Your mission is to break the Guardians of the Galaxy out of a fortress-like museum, where they are imprisoned. In fact, the mysterious Collector caught and imprisoned the Guardians for his personal collection. You board a gantry lift crane, which launches you into a daring adventure as you join Rocket Raccoon (who has escaped imprisonment) to help him set his fellow Guardians free. The new ride enhances the Tower of Terror's falling sensation with new visual and audio effects, including music inspired by the film. The rise and fall profile is randomized to create multiple, unique ride profiles. Wait Factor: High—Use a Fastpass to shorten your time in line, or try getting in line during the parades or evening shows. Herky-Jerky Factor: High (vertical jerks). Disney says it is not for anyone with neck or back trouble, heart problems or expectant mothers. Seating: Ride vehicles have three rows of seats, with a step up to get to the last row. Each rider has a seatbelt. You walk straight in and can get to the first row of seats without stepping up. Accessibility: The main queue has a lot of steps. Riders have to transfer from wheelchairs or ECVs to the ride vehicle by themselves or with help from others traveling with them. Wheelchairs enter through the same entrances as everyone else. Service animals may not ride. Some of the pre-show video monitors have guest-activated captioning. When you enter the Collector's private office, try to stand in the back of the room, or the middle. This will give you a better view of Rocket the Racoon explaining his plan for escape. Tip for seating: It’s best to be at the back of the line when waiting to go in because those people get seated in front row of the ride vehicle. If the cast members assign you somewhere else, ask politely, and they'll usually oblige, but you might have to wait for the next car. The ride photo is taken just before you drop for the second time. Put away your glasses and hat before you ride, or you may lose them. Guardians of the Galaxy is the tallest attraction at California Adventure. The experiences are randomized, making it different every time you ride. When Disney created Tower of Terror (the ride that preceded Guardians in the same structure), the Imagineers watched 156 episodes of “The Twilight Zone” for inspiration. They're not saying how many Marvel comics they read to create Guardians of the Galaxy. The architecture of the terrifying tower was inspired by Southern California landmarks like the Biltmore Hotel in downtown Los Angeles and Riverside's Mission Inn. It was redone for the Guardians ride, but it still has the same shape.